I haven’t had strawberry shortcake in years! My mom used to make it for us during the summertime for dessert. It was such a treat! I always loaded up on the whipped cream. My favorite part. I was excited that my responsibility for the recent partnership with Bozzuto was to make a treat replicating my childhood favorite dessert. Make the strawberry filling first. Place the strawberries in a small saucepan over medium heat. Stir constantly for about 4 full minutes until the strawberry juices have been released. Add the sugar and cornstarch and continue to stir for another 2 minutes. The mixture will be much thicker. Remove from heat and allow to cool as you prepare the cupcakes. Make the cupcakes: Preheat oven to 350F degrees. Line muffin tin with 12 cupcake liners. Set aside. In a medium bowl, mix together flour, baking powder, baking soda, and salt. Set aside. In a large microwave-safe bowl, melt butter in the microwave. Stir in sugar - mixture will be gritty. Stir in egg whites, yogurt, milk, and vanilla extract until combined. Split 1 vanilla bean down the middle lengthwise. Scrape seeds from half of the vanilla bean into batter. Make the strawberry whipped cream: In a large bowl, whip the cream, sugar, and vanilla extract together on high speed until stiff peaks begin to form, about 4-5 full minutes. Add the remainder of the strawberry filling and continue to beat for another 30 seconds. 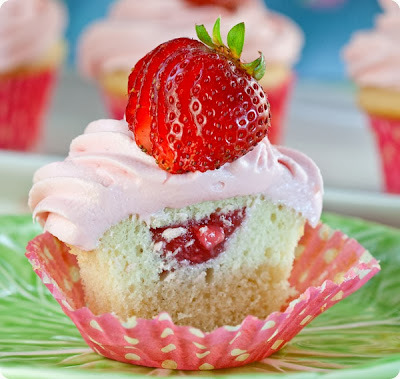 Frost the cupcakes with the strawberry whipped cream. You may have some whipped cream leftover.